Based on the emails I’ve received lately, my announcement of the Grow Your Own winter hiatus seems to have sparked concern, and I want to thank everyone for thinking of us. We are all well, no health problems, home life is just a little overwhelming right now. Caring for three little boys, two of whom have special needs, is a challenge and I have come to a place where I need a little break so I can find some balance at home. For now I will continue working in our garden, writing, and photographing, but without the self-imposed deadlines. I’ve dropped all freelance work for a little while and am assessing other things I participate in that have deadlines. This is not a permanent change, just a temporary adjustment to give us a breather. I will continue to write Grow Your Own posts in the coming months, I just can’t keep up with organizing an event until things settle down at home. Thanks to everyone for your understanding and support. I hope you will continue to share your Grow Your Own posts on your blogs and will join us when Grow Your Own returns in the spring. If you would like to sign up to host a Grow Your Own event for next year, you can email me at andreasrecipesgyo AT gmail DOT com. If you are new to Grow Your Own, visit the Grow Your Own page to learn more about the event. And don’t forget, if you have participated in the event at least once, you can join the Grow Your Own Flickr group to share your photos, just visit the page and ask to join. Thanks to everyone who participated this month. We had 12 13 participants from 4 5 countries, and we cooked with our homegrown tomatoes, chives, jalapenos, thyme, oregano, watermelon, mint, delicata squash, bell peppers, marrow squash, golden apple squash, cranberry red potatoes, and purple tomatillos. Mona’s tomato plants gave her some beautiful tomatoes for her healthy curry dish. 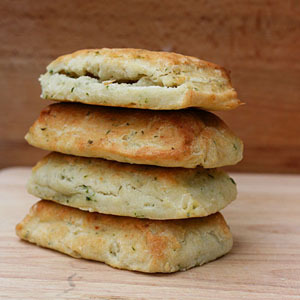 Elissa’s savory biscuits with homegrown chives are perfect breakfast comfort food. 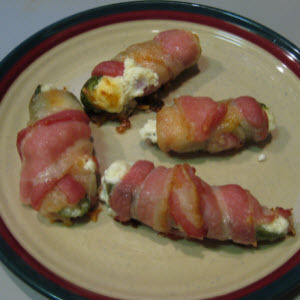 John’s homegrown jalapeno peppers make a perfect bite-size appetizer. Homegrown spinach makes Sayantani’s vegetable and lentil soup even more healthy. Kelly’s homegrown oregano and thyme added lots of flavor to her roasted zucchini pomodoro pizza. 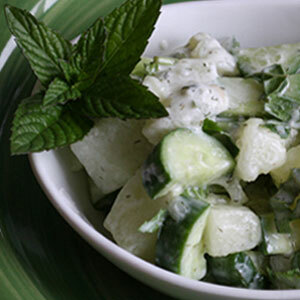 Winnie found one of her homegrown yellow watermelons, forgotten and forlorn in her refrigerator, and paired it with cucumbers and her homegrown mint to make a summery salad in October. 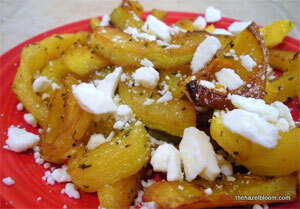 Kare tried growing her own delicata squash this summer and found out they taste delicious roasted with feta and rosemary. 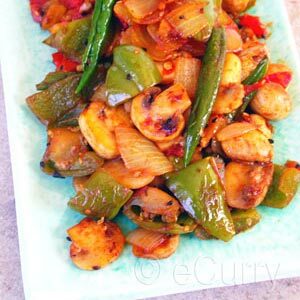 Soma’s homegrown peppers are perfect for her quick and easy stir-fry. 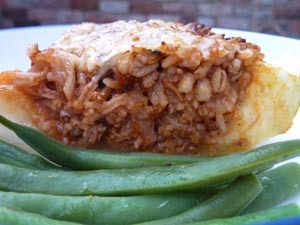 Nic grew marrow squash, a large elongated type which are perfect for stuffing. 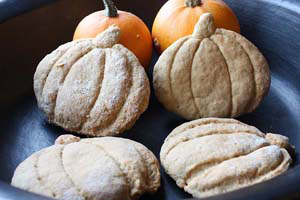 These adorable spiced pumpkin-shaped scones were made from homegrown golden apple squash. 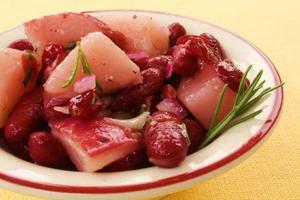 Linda’s colorful salad uses homegrown cranberry potatoes, which are slightly pink. She also made applesauce in a pressure cooker from their homegrown apples. 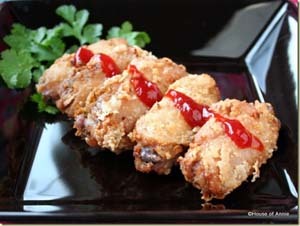 Nate and Annie made some ultra crispy Thai fried chicken wings using the cilantro roots from their garden in the marinade. 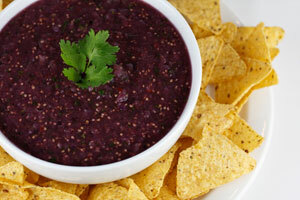 We grew both purple and green tomatillos in our garden and think the purple tomatillos make a beautiful salsa. 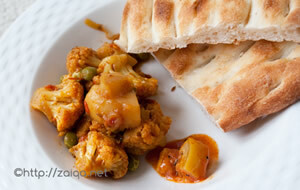 Great round up and some really tasty looking dishes there. Whoops! I forgot to send my entry in! Andrea, thanks for adding us. Your purple tomatillo salsa looks so interesting! Thank you so much for hosting Andrea. I have always enjoyed participating in GYO, solook forward to its return in the spring. In the meantime, take care of yourself and enjoy the winter season and all it brings.